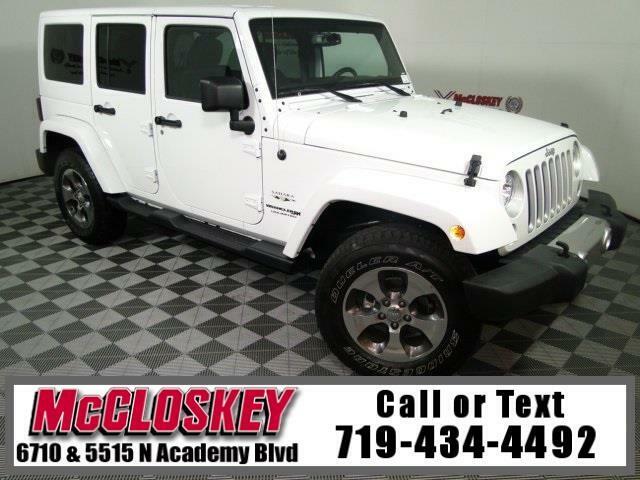 Versatile and impressive 2018 Jeep Wrangler JK Unlimited Sahara 4x4 with Keyless Entry, Fog Lamps, Premium Sound System, Running Boards, Premium Wheels, and Dependable V6 Engine! The midlevel Sahara is only available in the four-door configuration and adds to the Sport S with 18-inch alloy wheels, painted exterior body panels and trim, automatic headlights, automatic climate control and a 115-volt outlet. It also comes with a bigger driver information display, an additional USB port, and an upgraded version of Uconnect with a 7-inch touchscreen, Android Auto and Apple CarPlay smartphone integration, and satellite radio. A stout 3.6L V6 engine is backed by an intelligent eight-speed automatic.